Well, just when you think your Birchbox can get any worse . . . it does. As you know, I presumed I was getting the awful Box 16, which is what I indeed got today. So, the GOOD news is, each month you can review all of the products you receive and get 10 points per item. Once you have 100 points, you can cash out for $10 worth of items in their store. Since products from ALL of that month's products ship free, every 2-3 months, you can purchase a free full-sized item. Since I had 7 items this month, I can review all 7 for 70 points. Total value of box: $10.26. Perhaps the price evened out then? 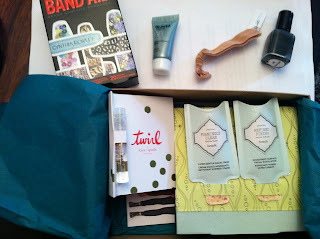 I do not know how much I will learn from using 1 time use samples, and I think Birchbox HAS gone downhill. This month, when you consider that the band-aids were not a part of my samples in the box (they were considered a "bonus"), my box's actual value was: $8.76, which is less than I paid for it. In the end, probably not the best value for subscription boxes out there. I got mine too but yours is actually better than mine was. I had 1 thing I would use this month. I thought they were getting better but maybe not. Do you have a link to yours? I love to share. I will use most of the box this month. Did you get the dreaded tape? Oh no! I wouldn't use any of these items, personally. Hope next month is better. I don't have a subscription. I hope they improve when so many are complaining. I guess the good news?? is that the boxes were pretty evenly horrible this time around. Thank you for such a honest review! I would have been disappointed as well if I had ordered this, and the company needs to know that! They really do. They have so many disappointed members. I did have almost $10 from reviewing 7 items, so that is the only thing that really "saved" my box this month. I was SO disappointed this month and last month. The samples are so tiny and nothing new. I plan on switching to glossybox if next months products are dismal. I really hope they do a Halloween theme and add in a long overdue full size product or something new/different.